12025 12v DC 0.16A. Check out ourLOT 5 deal. 12025 12V DC 0.14A. LOT 5 deal available. All 4 fans for your cMP. 922-8884; 922-9719. 922-8886; 607-3433. 922-8885; 607-3433. Parting out my Mac Pro. All Four Fans Including. Were working when I stopped using the computer. Needs a good cleaning. Model: DFS802512H. 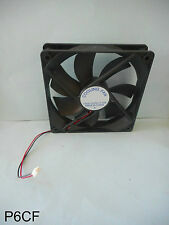 2-Wire 80mm 12V DC Fan 8cm/Dell/PC. DC 12V 0.23A. PCI Front Fan Cage Assembly. Processor Cage Front Fan with Speaker. 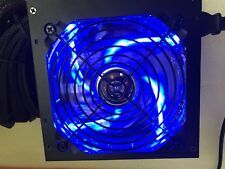 Processor Cage Rear Fan. 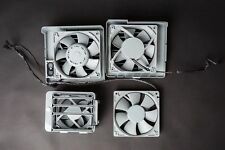 Four Apple Mac Pro 2009/2010/2012 Case Fans - Full Set. Removed from a working Mac Pro. Mac Pro model: 4,1 (year 2009); 5,1 (years 2010 ). 12025 12v DC 0.14A. Wholesale Lot of 5. Maximum Power: 350W. 400mm 150mm 150mm 3 x SATA Main Connector: 20 4-pin. Features: Connectors: 1x Main connector (20 4 pin):400mm. 1 x 12V (4 4-pin):400mm 2 x peripheral 1 x Floppy PCI-E- 6 Pin x 1:400mm. *FREE UPGRADE TO 1075W*SAME DAY FREE PRIORITY SHIP! XHY-8025 Winner 2pin 80mm fan. 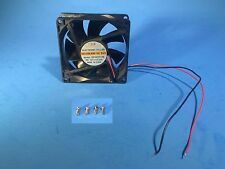 80mm cooling fan with 2-pin small molex connector, typically used in power supplies and proprietary cases. Its box states that it has sleeve bearing and only 29dBA noise level. Works great. Form Factor - Mother Board Connector - Internal 140mm ball-bearing fan. Current 25A 28A 28A 25A 0.5A 2.0A. 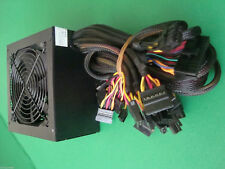 - SATA Connectors - 4 4 pin x 1. - CPU Connector. XHY-8025 Winner 2pin 80mm fan. 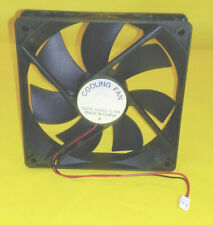 80mm cooling fan with 2-pin small molex connector, typically used in power supplies and proprietary cases. Its box states that it has sleeve bearing and 29dBA noise level. (Actual width is 135mm 2pin). Power Connector. Noise Level. 2 wire/ 2-Pin. 120mm fan for maxium airflow and 750 watt output to support those power-hungry components! Separate dual 12V rails. Quiet Performance. Output: 3.3V 22A, 5V 22A, 12V1 21A, 12V2 21A (12V combine 42A), -12V 0.5A, 5VSB 2A. Maximum Power Output: 750W. Check out our Gaming Power Supplies. We have a version with braided sleeves on all cables & Smart Fan :ATX-750-LED V2. (1) Floppy Drive Power Connector. (3) Molex Peripheral Power Connector (on 2 separate line of cables for unrestricted reach). SHARK TECHNOLOGY. Energy-efficient with less heat and wastes less electricity. Since the fan is situation inside the system, and not at the back of the PC system, audible fan noise is greatly reduced.